Paul McCartney Playing Barclays Center! This just might have to be my birthday present to myself. Paul McCartney has confirmed that his all-new 2013 “Out There” tour will include two New York shows: On June 8 and 10, Paul will play the Barclays Center in Brooklyn NY. The first-time engagement for Paul at the venue is his first New York appearance since last year’s historic 12-12-12 benefit and continues a tradition of legendary NYC area McCartney concerts including 2011’s Yankee Stadium doubleheader, 2009’s inaugural Citi Field three-play, and stretching all the way back to The Beatles’ 1965 musical christening of Shea Stadium. As previously announced, the tour will also be making stops May 18 and 19 in Orlando, FL at Amway Center, May 22 and 23 in Austin, TX at the Frank Erwin Center, May 26 in Memphis, TN at FedEx Forum, May 29 and 30 in Tulsa OK at the BOK Center, July 9 in Boston, MA at Fenway Park, July 12 in Washington DC at Nationals Ballpark, July 14 in Indianapolis IN at Bankers Life Fieldhouse, July 16 in Milwaukee WI at Miller Park and July 19 in Seattle, WA at Safeco Field. Tickets to the newly announced shows will be on sale beginning Monday, April 22 at 10 a.m. local time at Ticketmaster.com. American Express Cardmembers can purchase tickets before the general public beginning Friday, April 19 at 10 a.m. and concluding Sunday, April 21 at 10 p.m.. All times local. Press release and more “Out There” 2013 tour dates after the jump. 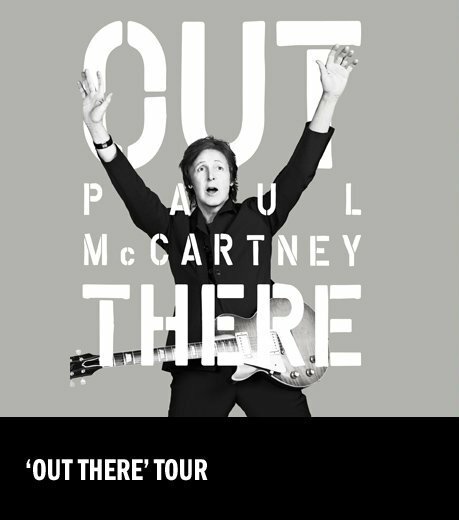 Paul McCartney’s “Out There” tour will feature brand new, never before seen production and, as ever, hours of material from the most beloved catalog in popular music, with Paul performing songs spanning his entire career–as a solo artist, member of Wings and of course The Beatles. Paul is throwing himself into 2013 with full force following yet another landmark year in 2012, which saw him conclude his record-breaking “On The Run” tour, release his Grammy-winning Kisses On The Bottom album, accept a star on the Hollywood Walk of Fame, play at both the Diamond Jubilee and Olympics Opening Ceremony, be named MusiCares Person of the Year, and headline 12-12-12 The Concert For Sandy Relief–to highlight just a few memorable moments. With the “Out There'” tour and a new studio album in the works, it looks like 2013 will show no signs of Paul slowing down. The “Out There” tour will see Paul and his band travel the world throughout the year, visiting both places of historical significance to Paul and new spots for the very first time. Further announcements and dates will be added in the coming weeks. Stay tuned to www.paulmccartney.com for official news and updates.